Let’s all take a moment together to wave farewell to summer. As much as I desperately don’t want it to go, the slight chill in the evenings is telling me the time has come. We’ve had a beautifully warm and sunny September so far, but in three days it is the official first day of fall. So it’s time to let go. Time to embrace sweaters instead of bikinis, hot tea instead of iced, pumpkin instead of peach. But while the peaches last I can taste summer. When you are baking with peaches, much as I said with the peach cobbler, the most time intensive and difficult part of the whole process is skinning the peaches. You have to boil a big pot of water and then dump your peaches in for a minute or two until the skin comes loose enough for you to peel off. It’s a bit of messy work you get peach juice all over your hands and sometimes the peaches aren’t as ripe as you thought and the skins are crazy stubborn. But when you’ve managed to skin all those peaches then you have a real treat on your hands. I’m sure you could make this pie with canned peaches that have already been skinned, and who am I to judge? Sometimes you don’t have the time but you really want peach pie! 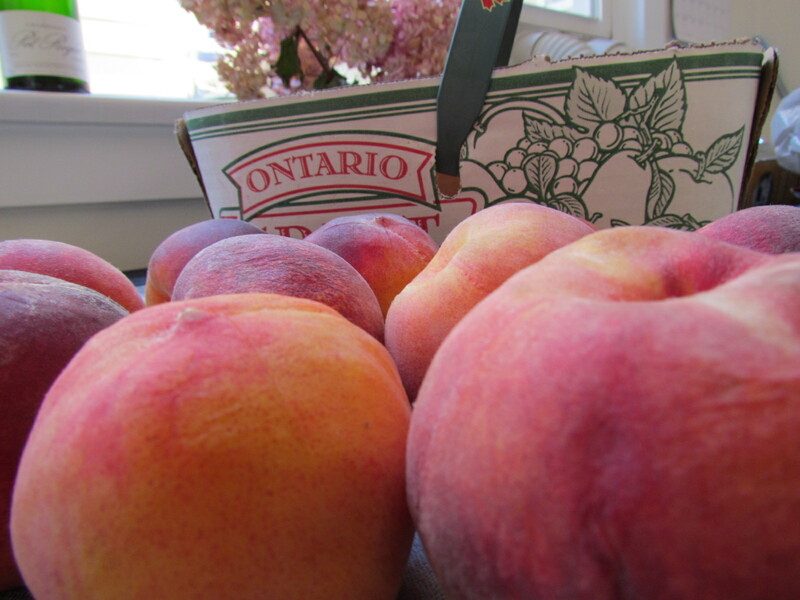 But it’s still sunny out, I’ve got nowhere to be and so it’s fresh peaches for my pie! 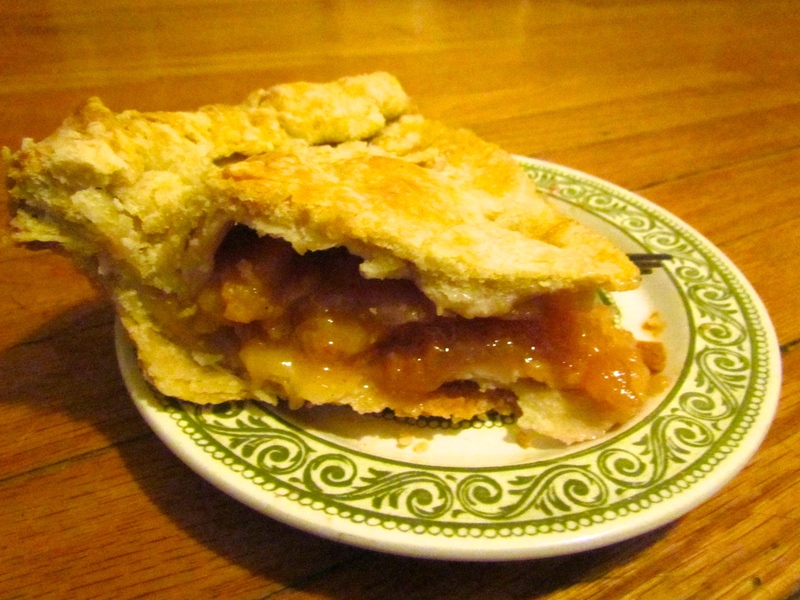 The other lovely thing about fruit pies is that they are usually vegan! Some people use an egg wash but that can easily be skipped. After you’ve skinned your peaches and sliced them up, you drop them in a bowl with some lemon juice, cinnamon and nutmeg, because those things just go together. While it’s sitting and getting all syrupy and juice it’s time to gather yourself for the task of making pie dough. You’ve got to take a deep breath or two, make sure you’re feeling good and then you can start. Pie dough is so simple, only a handful of ingredients, but sometimes you aren’t careful and the dough just doesn’t come together for your. I’m happy to say that for this pie the dough was on my side and it came out beautifully. Rolling the dough out and then carefully placing it in your pie pan with the edges hanging over is so satisfying. Life may be crazy and complicated but pie dough coming together means that things are going to be alright. 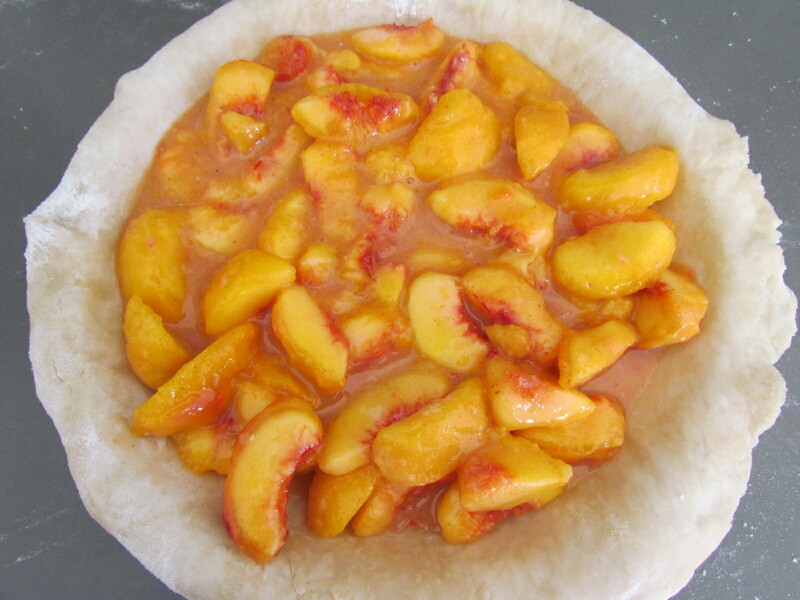 The peaches then get poured into the prepared pie crust. Looking just amazing and swimming in their own juices. I used about 8 small peaches but I could have used a couple more, the more filling the better in my opinion. It may seem silly but the bright and vibrant colours of fresh fruit make me so happy. I wish we had fruit in season here year round! 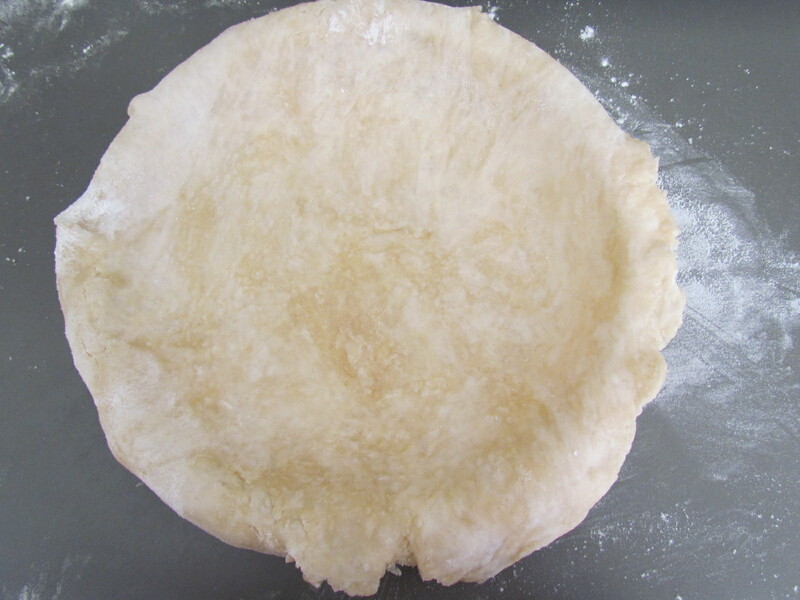 You place the other crust on top and fold the edges to make your crust. 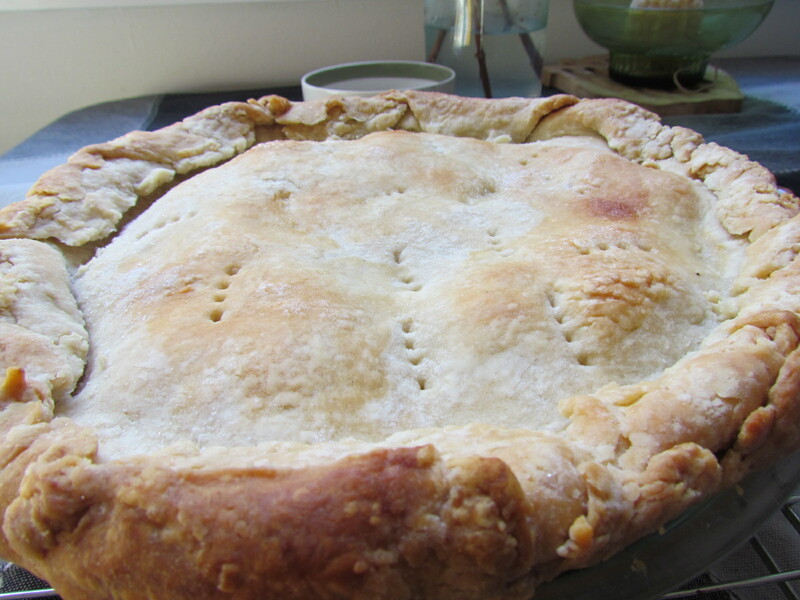 I should have trimmed some of it, but I like a really thick pie crust. Then you poke holes all throughout the top so that the steam can escape. Pop the pie in your pre-heated oven and wait for the buzzer to go off. The most difficult part of making a fruit pie is that you need to let it sit and cool once it’s ready. If you cut into it right away then the juice won’t thicken and your filling won’t be the right consistency. The cooler the pie is when you first cut into it the thicker the filling will be. Sadly the sun had set by the time the pie was ready to be cut into so I had to make do with artificial light for the next set of pictures. I was on a plane to Calgary early the next morning, so these aren’t the greatest pictures but I do what I can! 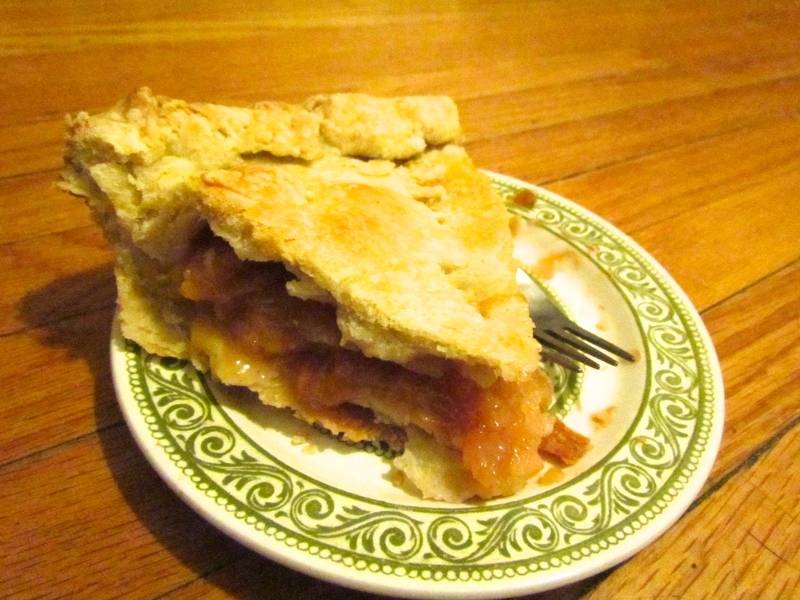 You can’t go wrong with peach pie. Or pie in general in my humble opinion. 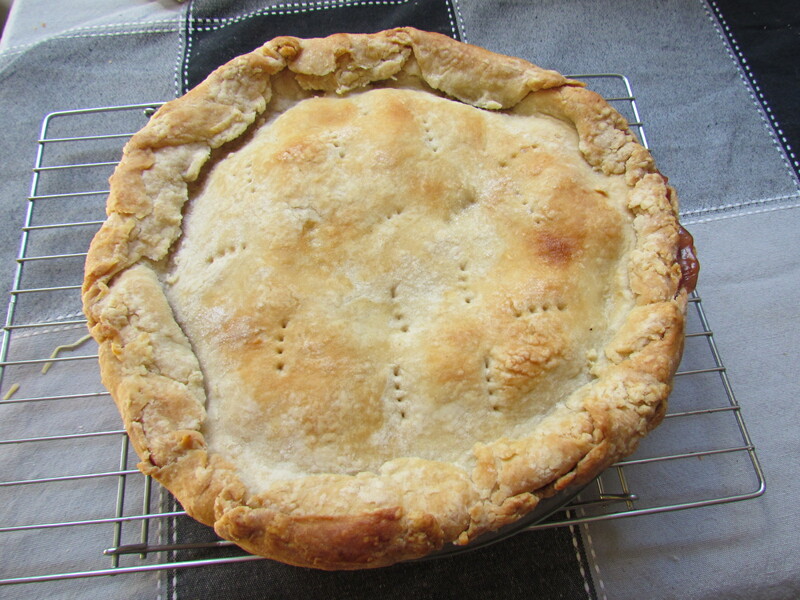 Fresh Ontario apples are all over the grocery stores now and I think soon the time will come for an apple pie. Before I know it it’s going to be Thanksgiving here in Canada. Which might just be my very favourite holiday. It’s all the delicious food of Christmas without the stressful build up. No presents just delicious food, family and friends. But I’m getting ahead of myself. For now I’m going to get the last of that vitamin D and eat myself sick on wild blueberries and fresh peaches. < Previous Who says a bulldog can’t swim? Next > Breathing in that mountain air . . .